This week I have a guest blog from the lovely Nutrition and Dietetics student Caitlin Kemp. 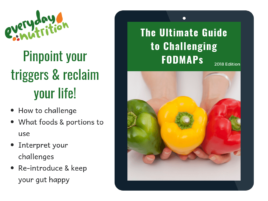 Are you confused about what to eat while following a low FODMAP diet? Do you feel overwhelmed by advice regarding what you can and can’t eat? 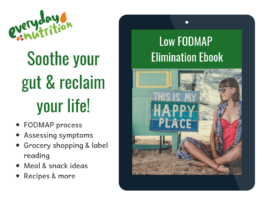 With much of the focus on identifying which foods to eliminate, the low FODMAP diet seems restrictive and quite honestly, not much fun. Be assured there are many delicious foods you can still ​enjoy while following a low FODMAP diet – it’s simply a matter of knowing which foods! Fear not, here’s a list of some of your favourite foods you may be surprised to know are FODMAP friendly. You can still enjoy the sweet nutritious goodness of fruit – however some fruits are better tolerated than others. Fruits are often high in the FODMAP sugar fructose (a monosaccharide). However, fruits that do not have excess fructose and contain equal amounts of glucose and fructose can be tolerated. This is because glucose acts as a carrier for fructose, enabling fructose to be absorbed into the bloodstream instead of continuing to the large intestine where it will be fermented by bacteria resulting in gut symptoms. Low fructose fruits include oranges, mandarins, ripe guava, honeydew melon, pineapple, grapes, kiwi fruit, passionfruit, raspberries and strawberries. Avoid eating large amounts of fruit (even low fructose varieties) as a large total fructose dose may cause IBS symptoms. We recommend sticking to one serve of fruit per meal or snack. Cheese lovers rejoice, a low FODMAP diet is not necessarily a dairy free diet! The milk sugar called lactose (a disaccharide and FODMAP sugar) is found in most dairy foods, but is highest in milk. Some cheeses are actually very low in lactose, because during the cheese making process the watery portion of the cheese (the whey) is strained out along with most of the lactose. Low lactose cheeses that are suitable for the low FODMAP diet include cheddar, colby, feta, mozzarella, Swiss and tasty cheese. Just because you have eliminated wheat from your diet doesn’t mean you can’t eat other grains. Rolled oats are low in FODMAPs at ½ a cup serve and a suitable food option. Try cooking with lactose-free milk to make porridge. Craving a drizzle of honey on your morning bowl of porridge? Use low FODMAP alternative maple syrup instead. Rice is another gluten-free grain that is acceptable to eat on a low FODMAP diet. For a more nutritious option, try brown rice as it still contains its outer layer so has more fibre than white rice. As discussed earlier, avoiding FODMAP lactose does not necessarily mean saying goodbye to dairy altogether. Regular yoghurt usually contains some lactose, however full-fat Greek yoghurt with no added sugar is low in lactose. This is because of the traditional straining process which removes the watery whey and most of the lactose. This is what makes Greek yoghurt so thick and creamy, and also a low FODMAP option! Try this: Blend with frozen blueberries, mint and rolled oats for a breakfast smoothie. As long as the jam hasn’t been sweetened with high fructose corn syrup (which is excess fructose overload! ), or has added fruit juice then strawberry jam is a suitable low FODMAP spread. Strawberries are a low fructose fruit, which make them low FODMAP. You can still enjoy an occasional drink while following a low FODMAP diet. 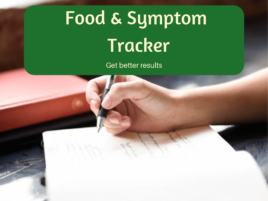 While beer is made from grains like wheat and barley (which are high FODMAP), most of the FODMAPs are lost during the processing and therefore can be tolerated on a low FODMAP diet. Wine is made from grapes (a low FODMAP fruit) so is also a suitable alcohol choice. Just be careful of sticky dessert wines which often contain excess fructose. Try this: It should be noted that alcohol can aggravate IBS symptoms, so intake should be limited to one glass of wine or one can/bottle of beer. Try this: Mix ¼ cup canned, drained and rinsed chickpeas into a salad with lettuce, tomato, cucumber and chicken slices. Milk and white chocolate contain moderate amounts of lactose due to their milk content (this is usually listed as milk powder or milk solids in the ingredients). This means these chocolate varieties are not recommended during the elimination phase. On the other hand, quality dark chocolate should contain no milk and therefore is a suitable low FODMAP treat alterative. Fructose and lactose are both FODMAP sugars, however there is another sugar which is not considered a FODMAP. This sugar is called sucrose and is also known as table sugar, white sugar, brown sugar or caster sugar. Sucrose is a double-sugar (disaccharide) made up of one glucose and one fructose molecule in a 1:1 ratio. It does not have excess fructose and this means it can be tolerated on a low FODMAP diet. Sucrose can be found naturally in some fruits and vegetables and is often added to baking. While sucrose can be tolerated on a low FODMAP diet, it’s important to check that sucrose-containing foods do not also contain other FODMAPs. Food doesn’t have to be bland when eliminating FODMAPs. Rather than focusing on what you can’t eat, focus on what you can eat. It’s also important to note that the elimination phase of the low FODMAP is not a lifelong diet. Some of the foods you are currently restricting in the elimination phase may actually be tolerated during the reintroduction phase. It’s just a matter of experimentation and patience. An Accredited Practising Dietitian will be able to guide you through every step of the way. Caitlin is currently a Nutrition and Dietetics student at Monash University. With a love for food and cooking from a young age combined with an interest in health and science, Caitlin is passionate about becoming a dietitian and helping others to improve their diets and lead a healthy lifestyle. When she is not studying, eating or cooking, Caitlin loves reading, keeping fit and planning her next travel adventure.